ShufflePoint is a report integration hub, pulling data from multiple sources and pushing data to multiple destinations and formats. 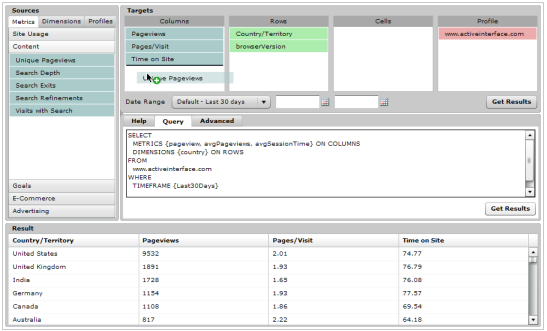 Using ShufflePoint, you can easily review email campaign metrics side-by-side with the resulting web analytics metrics. Then quickly share this unified data with colleagues and clients in Excel to disseminate your findings in the format of your choice. ShufflePoint is based upon our powerful Analytics Query Language (AQL). AQL, which is similar to SQL, provides many features that resolve issues related to consistently reporting web analytics data. The query tool is used to create and run AQL queries, verify the results, generate data access files for Excel®, and create URLs for Google Earth, Google Maps and Google Charts. If you like our data integration approach but have need for data from a service not listed, please contact us for information about having us create an integration.